“We have openly said in the Council of Europe that sanctions will not solve the problem. Sanctions will only create wider problems for the whole European Union. It turns out that these sanctions will be paid for by the people from the smallest of the countries,” he said, adding that Cyprus is very closely connected with Russia. The heads of other EU countries such as Greece, and Hungary have repeatedly said the sanctions primarily hurt the ones who impose them. 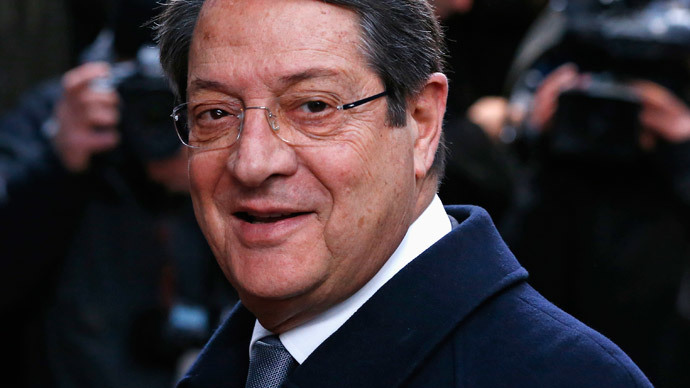 Talking about the political side of the conflict, Anastasiadis stressed it’s important for the leading powers to help resolve the problem in a peaceful way. "I hope that in the current conditions, with the participation of Chancellor Angela Merkel, President Francois Hollande and President Vladimir Putin, a diplomatic solution will be found, for there is simply no other way. It will allow everyone to come out victorious in this situation." Anastasiadis said when he took office the country’s foreign policy would be reoriented towards strengthening ties with the US, however, it didn’t mean giving up political ties with other countries. “I then explained that it would no way happen at the expense of relations with our traditional friends, such as Russia,” he said recalling Moscow’s support in the question of the republic’s existence back in 1974. The trust of Russian businessmen in Cyprus and its public authorities when the crisis hit in 2013 has become one of the most important factors in the country’s recovery, said Anastasiadis. “We were on the road to disaster. Indeed, we were on the threshold of a catastrophic collapse on the verge of default,” he said, adding that the support and the trust of the Russian companies enabled them to gradually capitalize the banking system and at the same time rationalize it. “We re-entered the world market just half a year after the crisis. We have updated our ratings from international rating agencies - all this has allowed us to establish order in the framework of the activities carried out in order to modernize our public administration,” he said. Cyprus is still experiencing difficulties, but Anastasiadis hopes there will soon be more interest in investment and more jobs will be created, even with unemployment at a high level of 16 percent. Cyprus has suffered serious damage from the Russian response to EU sanctions and expects a severe downturn in the tourism industry in 2015, said Georgios Kasoulides, Ambassador of the Republic of Cyprus to Russia. Nikos Anastasiadis sees his visit to Russia from February 24 to 27 as “one of his most important trips abroad," saying his country is very grateful for the trust shown by the Russians to the Republic of Cyprus, especially during the banking crisis of 2013. "We show deep gratitude to the Russians,”said Anastasiadis.“This is the feeling that makes us stand in the Council of Europe against the measures that might hurt friends who had shown confidence and gave us hope for a rapid recovery and a way out of the crisis."